Why do the International Health Regulations (IHR) matter to me? How will the IHR protect America’s health? Who is in charge of making sure countries reach IHR goals ? 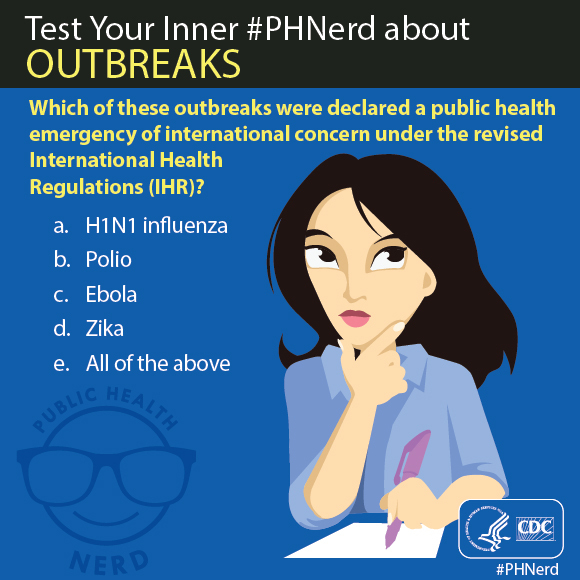 What diseases are notifiable as a potential public health emergency of international concern (PHEIC) under the IHR? How quickly do PHEIC’s have to be reported? What is the timeline for countries to meet the goals of the IHR? What is CDC doing to help countries meet the goals of the IHR? How are the IHR Related to the Global Health Security Agenda? A health threat in one part of the world can threaten health anywhere – or everywhere. The International Health Regulations (IHR) are an international agreement focused on addressing serious public health threats that have the potential to spread beyond a country’s borders to other parts of the world. One of the most important aspects of the IHR is the requirement that countries will detect and report events that may constitute a potential Public Health Emergency of International Concern (PHEIC). Global outbreaks like SARS and Ebola have taught us that an outbreak in one country can easily spread into another. We are all responsible for stopping outbreaks before they become epidemics. The IHR are a framework designed to better protect the world from health threats spreading out of control. The IHR define the standards that countries must meet to be able to prevent, detect, and respond to public health threats. The IHR require each country to be able to stop outbreaks of infectious diseases before they spread internationally. The IHR also seek to create a global network that can rapidly exchange information, as well as global networks to stage a coordinated response in the event of an emergency. Who is in charge of making sure countries reach IHR goals? Some diseases always require reporting under the IHR, no matter when or where they occur, while others become notifiable when they represent an unusual risk or situation. Other diseases that might spread quickly through a nation or region. These might include things like cholera, plague, or a viral hemorrhagic fever, like Ebola. Serious illnesses of unknown origin. How many countries have chosen to participate in the IHR? Countries had agreed to reach the IHR goals by 2016, but many countries have not yet met them. CDC works with countries across the globe to support reaching these goals to protect Americans from public health threats that have the potential to spread internationally. CDC assumes a lead role in IHR implementation as it relates to human disease. Our main focus is on helping countries build the capability to prevent infectious disease outbreaks when possible, detect them rapidly when they occur, and respond effectively to ensure that they do not spread internationally. In 2014, most countries had not met the requirements of the IHR, and it was clear that progress toward IHR needed to be accelerated. The United States and a group of like-minded countries launched the Global Health Security Agenda (GHSA).7 The GHSA provides a structure to help countries reach IHR compliance. The GHSA brings much needed attention and resources to global health protection and helps us actualize the IHR by creating clear goals and activities that support the regulations. The GHSA will help us close the gaps left by the IHR – gaps that could leave us vulnerable to disease threats. CDC. Global Health – International Health Regulations. WHO. Case definitions for the four diseases requiring notification in all circumstances under the International Health Regulations (2005). WHO. Annex 2 of the International Health Regulations (2005). WHO. Strengthening health security by implementing the International Health Regulations (2005). CDC. Global Health Security Agenda: Action Packages. CDC. Global Health Security Agenda.